Over the years our 2 day bushcraft course has proven to be our most popular bushcraft course. It’s been carefully designed to initiate you into the joys of outdoor living, although many of the skills that you’ll be taught are easily transferable to other outdoor activities. This 2 day bushcraft course is intended for people who would like to understand what bushcraft is all about and to learn simple, repeatable bushcraft and survival skills, including campers, backpackers, hikers and other outdoors people who wish to learn some of the skills required to be comfortable in the outdoors, so that you have the time to really enjoy what is around you. 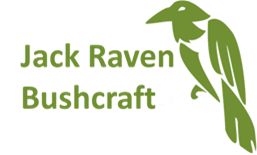 We have people attend who have no previous bushcraft experience as well as those with some prior experience and we can say with absolute honesty that everyone leaves knowing more than when they arrived! Gather your own materials and light a fire following a method that will work in all weather conditions. At the end of this bushcraft course you will have a good working knowledge of the skills needed to enjoy your time in the woods or enhance your camping or outdoor activities. I came on a 2-day bushcraft course here with my friend. The camp was really surprising, they've done a great job building areas! Food was amazing and I really enjoyed the whole experience - sleeping under the tarp, learning how to light and build our own fires & wood carving. Bob, Gary & Nicole were great (and Willow)! Would recommend. I did the weekend bushcraft course. Very professional yet warm & friendly. Very informative & plenty for us to partake in. Camp was more amazing than imagined & we were fed fabulously too! was sad when it was over so would definitely book another course with Jack Raven. Just returned from the October 2 day Bushcraft weekend and what a fantastic weekend it was. Not only were we blessed with lovely weather but Gary and Ho Kyung provided a great learning experience while Nicola cooked the most delicious meals and all this is set in a beautiful woodland. All round great experience and would highly recommend for anyone looking to learn some new skills while leaving the hustle and bustle of modern day life. Just completed the 2 day bushcraft course, thoroughly enjoyed the whole weekend. Learned lots of new skills from Gary who was a very knowledgeable tutor - his depth of knowledge was impressive and very patient!! Nicola looked after the camp and provided lovely food for all. Great to spend time in the woods with like minded interesting people. Recommend it to anyone wanting to expand their outdoor skills. Thanks so much for a awesome weekend guys! Learnt so much in a really relaxed fun atmosphere. I'll be back! Lovely to have Willow charming everyone aswell.